In the early 1980’s, they were seen as an innovation that was doomed to fail. At a time when many football fans weren’t willing to accept change, they flew in the face of tradition, while many players weren’t exactly welcoming. Nevertheless, a handful of football clubs in England had installed artificial playing surfaces to try and help them get through the winter period unscathed. Famously, Queens Park Rangers, then a mid-table club in the old Division One, were the first to install a synthetic pitch, much to the derision of fans, players and coaches alike. The pitch was deemed an overwhelming failure, although not long afterwards, Preston North End, Oldham Athletic and Luton Town had given artificial turf a chance. In 1994, Preston North End were forced by the FA to rip up their artificial pitch at Deepdale, leaving them out of pocket and forced to make changes that would be difficult for them, as they were plying their trade in the lower leagues back then. However, technological changes brought about an eventual change of heart by the sport’s authorities just a decade later. In 2004, FIFA had lifted the worldwide ban on artificial surfaces, giving them their full support. As a result, more teams, especially those in northern countries which endure harsh winters had chosen to go for synthetic pitches over grass. The most notable example to date is that of the Luzhniki Stadium in Moscow, home of the Russian national team and Spartak Moscow. The surface at the Russian national stadium has caused plenty of controversy, although teams not used to it such as Manchester City and Celtic have won against Spartak in recent years. As for the possibility of these pitches becoming commonplace closer to home, they’re already in use throughout the lower leagues in Scotland. As for England, the FA opened a consultation in 2012 on whether they should be allowed back. Should they be given the green light, the pitches could well be much improved compared to their predecessors, while the environmental and financial benefits may make them even more palatable to a number of clubs. One of the main benefits artificial pitches could bring is putting an end to match postponements through bad weather. Artificial pitches are easy to clear and rarely succumb to damage by rainy or snowy weather. In putting postponed matches to bed, they will save teams a lot of money. 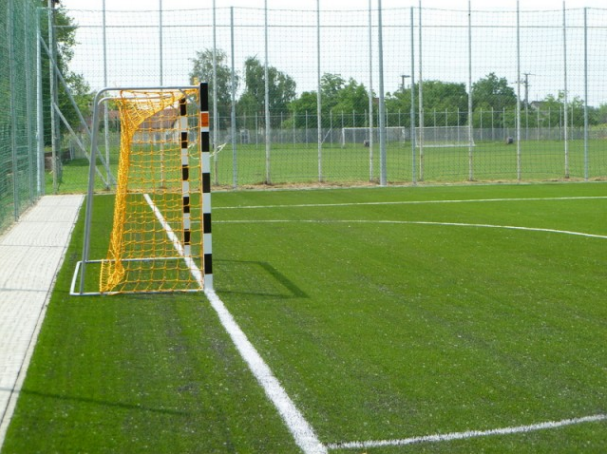 Another possible benefit to clubs considering going for an artificial pitch may come in reducing the need for excessive maintenance, which a lot of smaller clubs are not able to readily afford says Paula Rodham from Hi-Tech Turf. They won’t have to hire someone full-time to look after the pitch, stand to spend less on painting the lines and won’t need to rely on sprinklers so much to keep the surface from drying out in the summer, a process which requires millions of gallons of water each year. Despite the possible gains, traditionalists may continue to argue that, no matter how far artificial surfaces have come on in recent years, they still have their flaws. Concerns remain over how injuries could be exaggerated by them and how the ball might move, still pervade among the traditionalists – where it is still perceived as an essential character to the game. Paula further commented that artificial playing fields reduce the need for land – which could apply to both professional football clubs as well as your local sports teams. The lifecycle of the turf extends far beyond that of real grass and many clubs could be facilitated on smaller inner-city grounds, rather than having to go to remote suburban locations to play.